위암 검진 효과를 분석한 영국의 메타연구입니다. 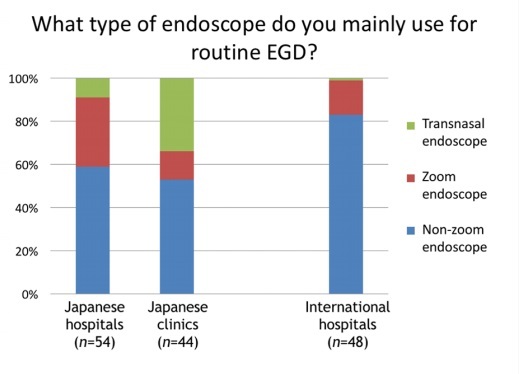 "About 73% of the screened patients were found to have EGC compared with 43% of the nonscreened patients." 내시경에 비하여 바륨 검사는 위암을 20% 밖에 발견하지 못한다고 합니다. 위암 검진용 바륨 검사는 부도덕한 일로 간주되어야 할 것 같습니다. 위암 예방을 위한 제균치료의 효과를 분석한 타이완의 메타연구입니다. 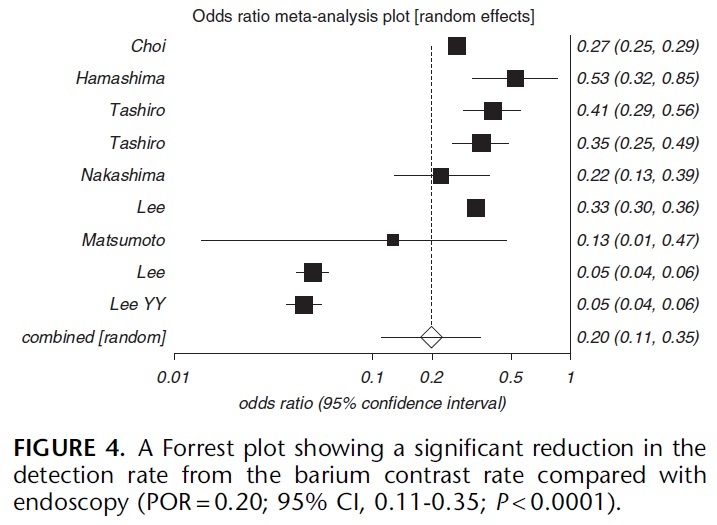 General population 및 ESD 환자군 모두에서 positive result입니다. Pooled incidence rate ratio가 각각 0.62, 0.46이었습니다. 서울아산병원 최기돈 교수님 팀에서 위암 내시경치료 후 국소재발을 분석하였습니다. 1995년부너 2011년까지 3,347예의 조기위암 내시경치료 중 3,027예(90.7%)가 margin-negative EGC였습니다. 22예의 국소재발과 4배수의 control을 비교하였습니다. 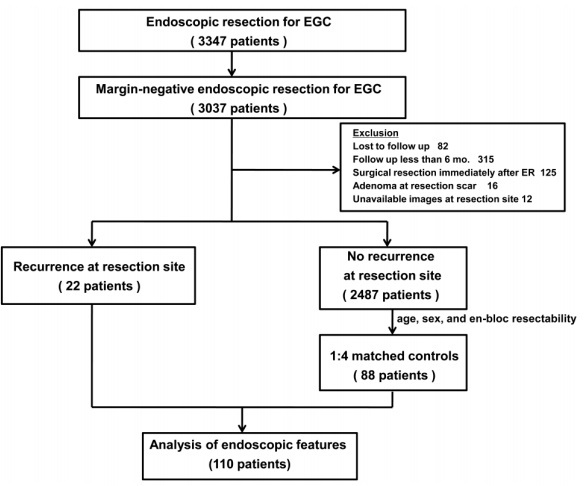 Differentiated type EGC의 en-block margin negative resection scar가 hyperemic change 없이 flat 하면 조직검사를 할 필요가 없다고 결론짓고 있습니다. 제가 근무하는 기관에서는 경험 및 자료 축적이 필요하다고 생각하여 당분간 국립암센터 및 서울아산병원에서 제안한 것보다 조금 tight하게 검사하는 전략을 유지하고 있습니다. 아래는 2016년 2월 현재의 방침입니다. 평균 16mm의 조기 바렛식도암 내시경치료의 두 방법(EMR과 ESD)을 비교한 독일 연구입니다. 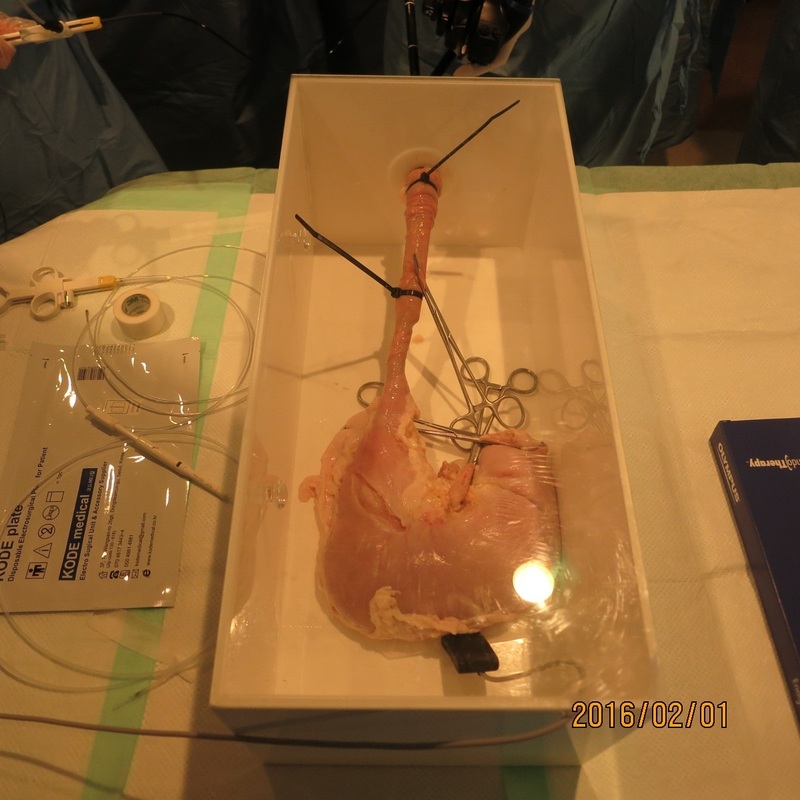 ESD는 R0 resection rate가 높지만, 시간이 많이 걸리고 합병증이 흔합니다. 독일 연구자들은 치료 효과가 비슷하다는 이유로 ESD를 과소평가하고 있습니다. 제가 보기에는 ESD 술기를 갈고 닦아서 합병증 없이 잘 시술하면 결과가 다를 것 같습니다. 최근 우리나라 몇몇 병원에서 돼지 stomach을 이용한 ESD hands on training이 진행되고 있으며, 대한소화기내시경학회 ESD 연구회에서도 조만간 동일 프로그램을 open할 예정입니다. 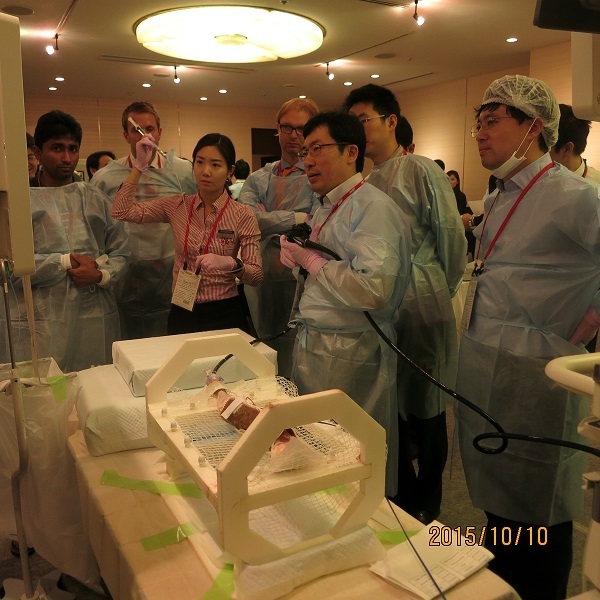 일본에서는 오래 전부터 돼지 stomach을 이용한 ESD hands on training이 매우 활발하게 진행되었습니다. 우리나라 선생님들도 일본의 hands on training에 강사로 초빙되기도 하였습니다. 일본 연구자들은 돼지 stomach으로 오래 훈련하다보니 어느 부분이 ESD 연습에 적합한지 궁금했던 모양입니다. 결론적으로 greater curvature는 좋지 않고 전벽과 후벽이 좋다는 이야기입니다. 아래 사진과 같이 좌측 greater curvature는 사람과 돼지가 영 다른데 우측 anterior wall은 사람과 돼지가 비슷하다고 합니다. Simulator box에 돼지 stomach을 거꾸로 장착하면 upper stomach 전벽과 후벽도 ESD 연습에 사용할 수 있다는 아이디어가 흥미로웠습니다. 일본소화기내시경학회와 일본위암학회가 공동으로 조기위암 내시경치료 가이드라인을 냈습니다. 일본의 쟁쟁한 멤버들이 총동원 되었습니다. Indication table과 curability decision criteria table을 따로 제시했다는 점에서 보다 명료해졌다고 생각됩니다. 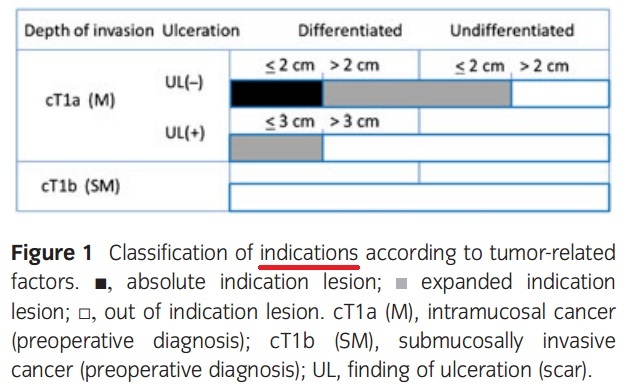 Scar를 포함한 ulcer finding이 있는 differentiated type 점막암 3 cm까지 expanded indication에 포함되어 있습니다. 그러나 점막하암으로 판단된 경우(cT1b)는 크기와 무관하게 expanded indication이 아니라는 점에 유의합시다. 위아래 두 표를 비교하면 금방 알 수 있습니다. 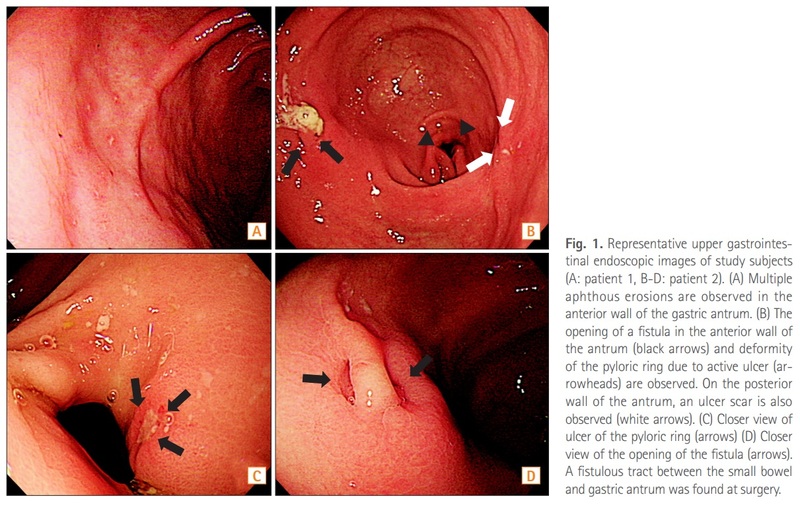 ACG Clinical Guideline: Diagnosis and Management of Barrett's Esophagus (Shaheen NJ. AJG 2016). 2016년 바렛식도 가이드라인이 나왔습니다. 제가 흥미롭게 본 부분은 아래와 같습니다. 1 cm 미만의 바렛식도 의심부위는 바렛식도로 진단하지 않도록 권하고 있습니다. 조직검사도 하지 말라고 합니다 (should not be performed). Recommendation 2 . 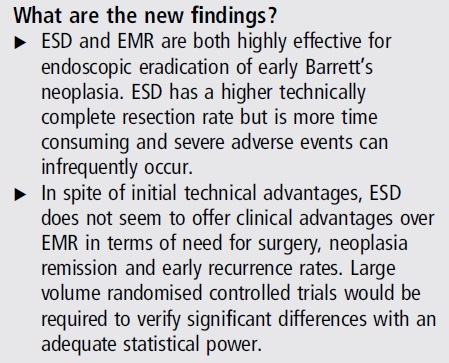 Endoscopic biopsy should not be performed in the presence of a normal Z line or a Z line with < 1 cm of variability (strong recommendation, low level of evidence). BE has been traditionally defined as the presence of at least 1 cm of metaplastic columnar epithelium that replaces the stratifi ed squamous epithelium normally lining the distal esophagus. 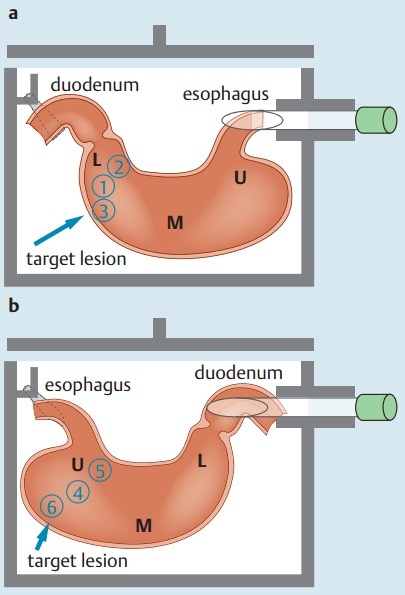 The reason why such segments < 1 cm have been classifi ed as "specialized IM of the esophagogastric junction" (SIM-EGJ) and not BE is because of high interobserver variability as well as the low risk for EAC. 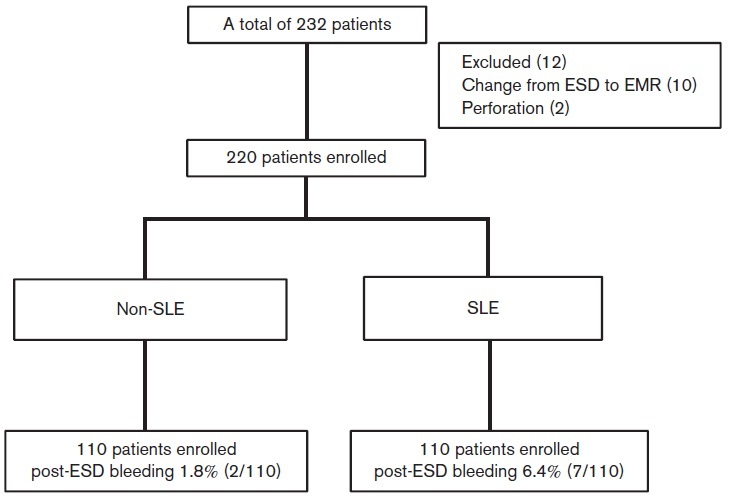 Patients with SIM-EGJ have not demonstrated an increase in the development of dysplasia or EAC in large cohort studies aft er long-term follow-up, in contrast with patients with segments of IM >1 cm. 바렛식도라도 dysplasia가 없으면 내시경을 너무 자주 하지는 않도록 권하고 있습니다. 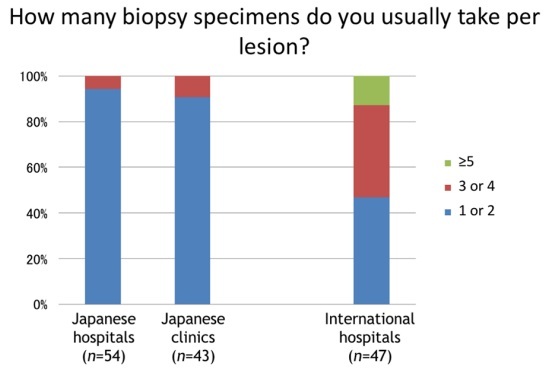 Acknowledging recent data on the low risk of malignant progression in patients with nondysplastic BE, endoscopic surveillance intervals are attenuated in this population; patients with nondysplastic BE should undergo endoscopic surveillance no more frequently than every 3-5 years. 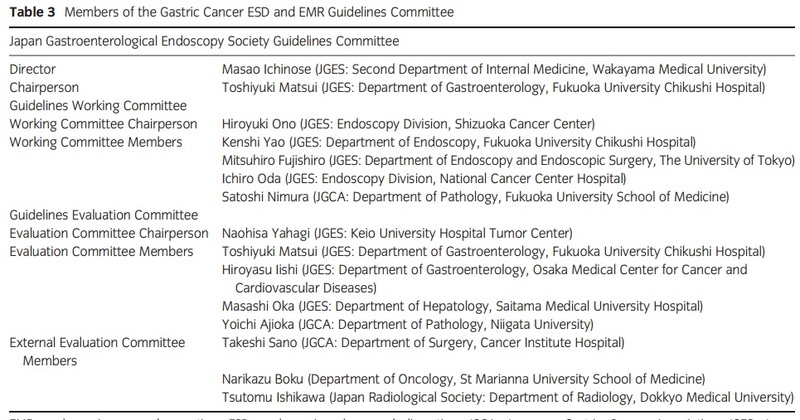 Neither routine use of biomarker panels nor advanced endoscopic imaging techniques (beyond high-definition endoscopy) is recommended at this time. 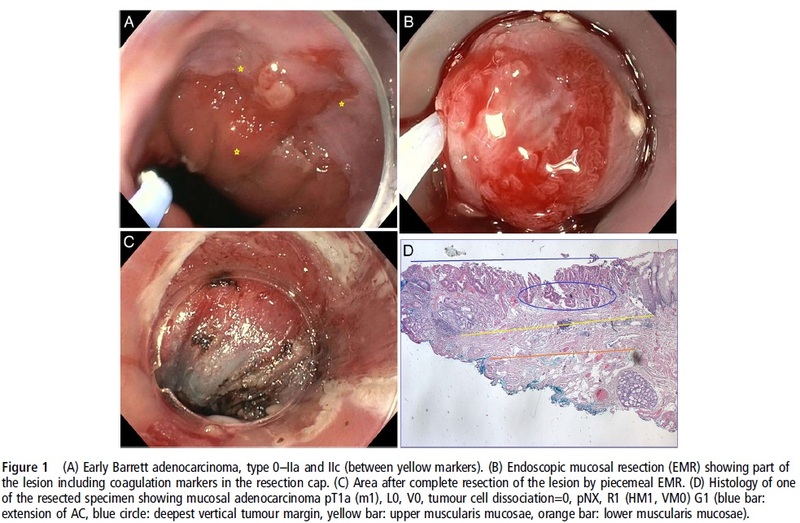 Endoscopic ablative therapy is recommended for patients with BE and high-grade dysplasia, as well as T1a esophageal adenocarcinoma. 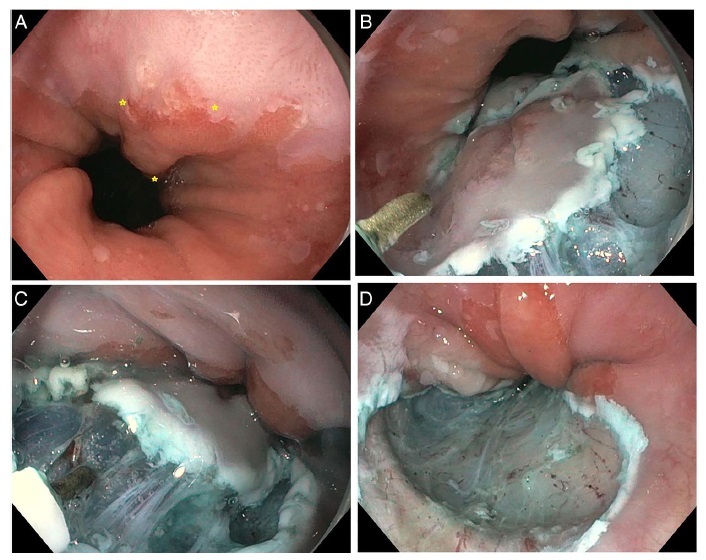 Based on recent level 1 evidence, endoscopic ablative therapy is also recommended for patients with BE and low-grade dysplasia, although endoscopic surveillance continues to be an acceptable alternative. 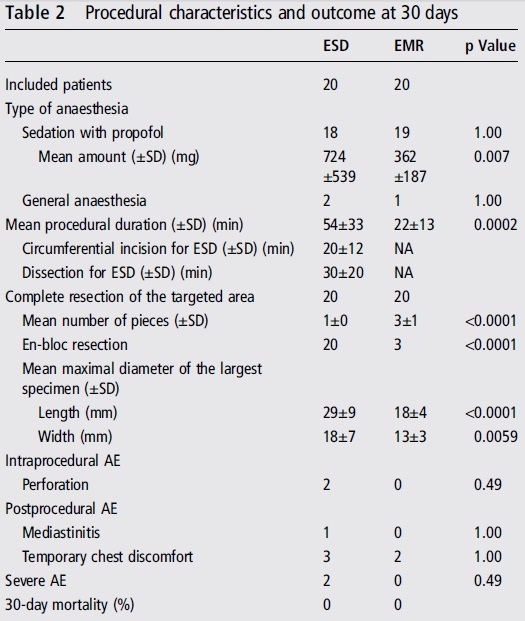 Given the relatively common recurrence of BE after ablation, we suggest postablation endoscopic surveillance intervals. Chomoprevention으로 PPI 사용을 권하고 있습니다. Recommendation 26 . Patients with BE should receive once-daily PPI therapy. 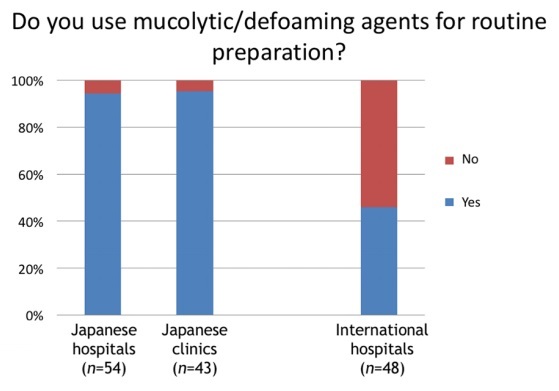 Routine use of twice-daily dosing is not recommended, unless necessitated because of poor control of refl ux symptoms or esophagitis (strong recommendation, moderate level of evidence). PPI therapy is common in patients with BE, in part because of the high proportion of those patients who also have symptomatic GERD. In these cases, the use of PPIs is substantiated by the need for symptom control, making consideration of chemoprevention secondary. However, even in patients without refl ux symptoms, in whom BE is incidentally found during evaluation of other symptoms and/or signs, the use of PPIs deserves consideration. 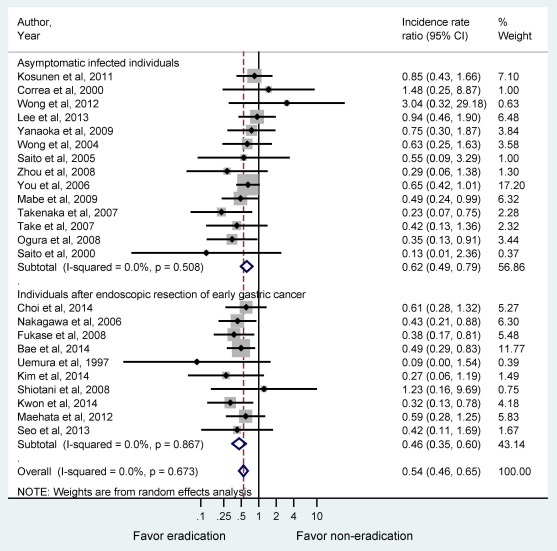 Several cohort studies now suggest that subjects with BE maintained on PPI therapy have a decreased risk of progression to neoplastic BE compared with those with either no acid suppressive therapy or those maintained on H2RA therapy. In addition, the risk profi le of these medications is favorable in most patients, and the cost of this class of drugs has diminished substantially in recent years because of the availability of generic forms of the medications. These factors, combined with the theoretical consideration that the same infl ammation that may be in part be responsible for pathogenesis of BE may also promote progression of BE, make the use of PPIs in this patient population appear justifi ed, even in those without GERD symptoms. Given the low probability of a randomized study of PPI use in BE, decisions regarding this intervention will likely rely on these retrospective data and expert opinion. 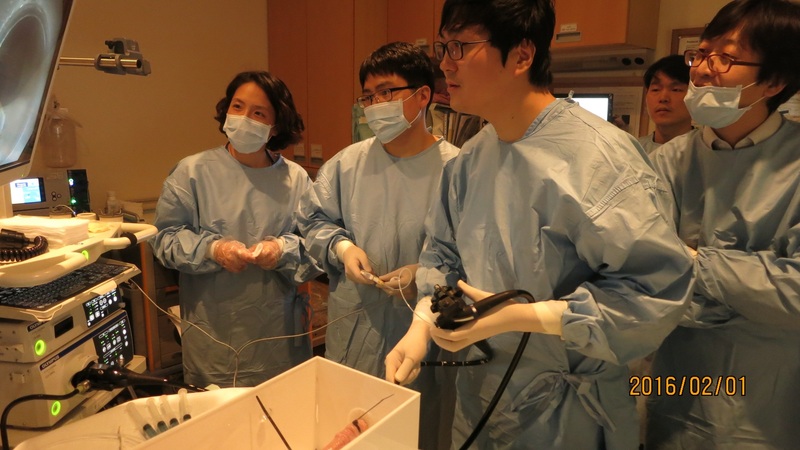 부산대와 고신대가 협력하여 ESD 후 second-look endoscopy의 의미를 분석하였습니다. 전체적으로 negative study입니다. 즉 routine하게 second-look endoscopy를 할 필요가 없다는 것입니다. 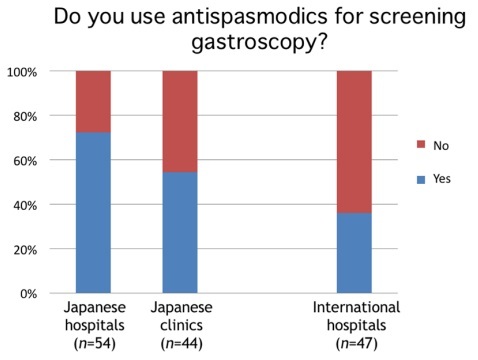 오히려 second-look endoscopy를 받은 환자에서 출혈률이 높았습니다. 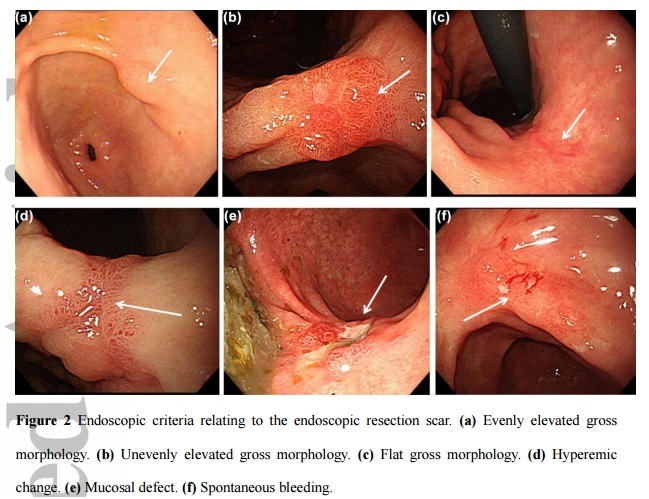 저자들은 second-look endoscopy 자체가 출혈을 일으킬 위험이 있다는 점을 지적하였습니다. 전적으로 동의합니다. 꼭 필요하지 않은 검사는 부작용, 합병증만 일으킬 뿐입니다. 일본과 일본이 아닌 다른 나라(타이완, 타이, 말레이지아, 한국, 중국, 이탈리아, 미국, 호주 등)의 여러 선생님들의 내시경 style에 대한 survey 결과가 발표되었습니다. 한국에서는 저를 포함하여 5분이 설문에 참여하였습니다. International group의 대표성이 떨어지는 자료이지만 일본의 내시경 현황을 살펴볼 수 있는 좋은 기회라고 생각됩니다. Survey인 관계로 현실과는 약간 다를 수 있다는 점을 감안해 주세요. 일본이나 기타 나라 모두에서 antispasmodics를 사용하지 않는 경우가 많았습니다. 저는 특별한 금기증이 없으면 거의 항상 사용했는데요... 고민해 볼 이슈입니다. Antispasmodics를 빼고 검사해도 결과에 차이가 없다면 엄청 편해질 것 같습니다. 일본에서는 mucolytics/deforming agents를 거의 항상 사용하는군요. 상부위장관 내시경의 검사 시간은 역시 5분 전후가 가장 많은 것 같습니다. 3분은 분명히 부족한 시간입니다. 일본사람들은 병소 당 조직검사 수가 매우 적습니다. 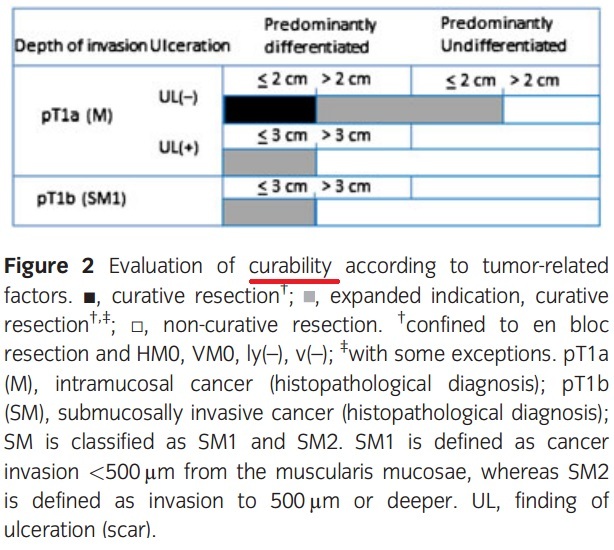 한개 혹은 두개 정도 target biopsy 하는 것이 일본 스타일입니다. 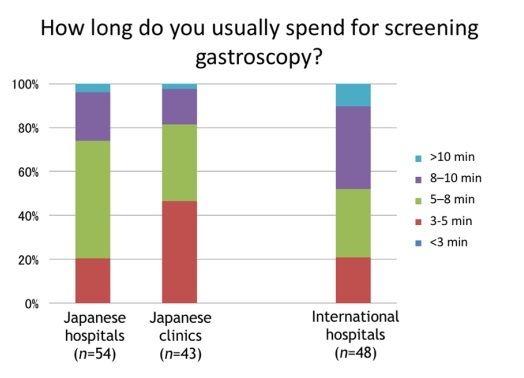 Intestinal Research 2016년 첫호에 실린 Spectrum of chronic small bowel diarrhea with malabsorption in Indian subcontinent: is the trend really changing?을 소개합니다. 인도에서는 생각보다 기생충증이 아직도 중요한 부분을 차지하고 있었습니다. 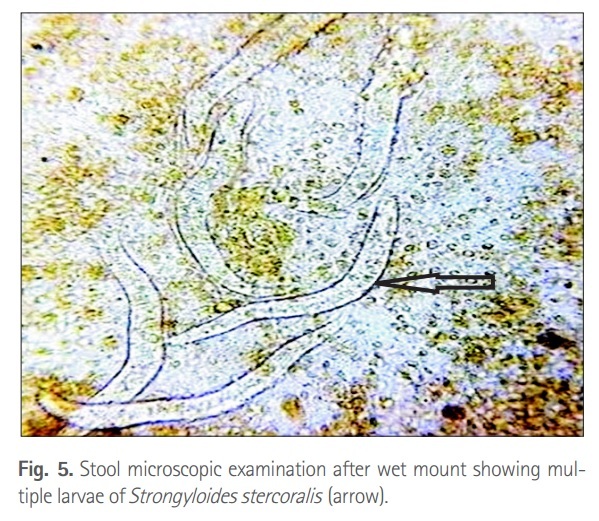 분선충 (Strongyloides stercoralis)도 흥미롭군요.